Who: Webinars are open to everyone - please join us! ​The Association of Colleges of Sisters of St. Joseph (ACSSJ) draws together nine colleges and universities founded by the Sisters of St. Joseph to articulate and further the contemporary expression of the educational mission and legacy of the Sisters of Saint Joseph. The Association fosters collaboration among all the member institutions, provides resources for faculty, staff and students at member colleges and universities and encourages mission integration on each campus. 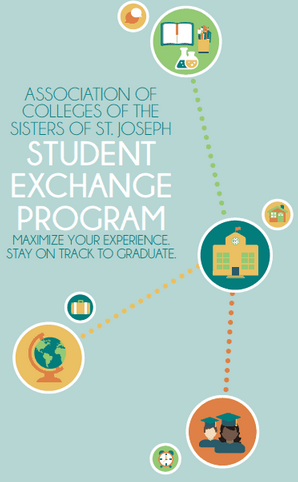 ​The Association of Colleges of Sisters of St. Joseph fosters collaboration among all the member institutions through a bi-annual conference, student and faculty/staff exchange program and other programs. For more information, please contact: Martha Malinski, Executive Director: acssj1@gmail.com or (317) 721-1153.